Canals are a unique feature of boating. While oceans, rivers, and other waterways have drawn their boundaries over the course of thousands of years, naturally in balance with the landscape around them, were carved out by human effort. Therefore, they have unique features of which all boaters should be aware. 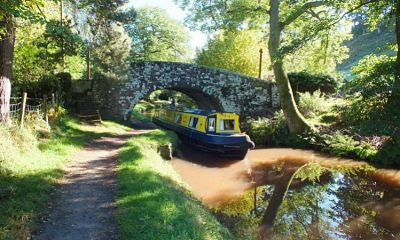 The first thing to know about canals is that they use the same navigational signs and signals as other bodies of water. Channels will be marked with green and red buoys, and the phrase “red right returning” (as in, returning to harbor) will tell you the general directions of navigation in the canal. Like many rivers, canals can be narrow, although fortunately since they are manmade their borders are often clearly delineated. Still, stay away from the edges of the canal and if you are in a sailboat, make your way through the canal under motor power if possible. This is not always the case, but in certain canals the currents can be quite powerful and the tide can affect when you are able to travel through it. The first step in knowing how to deal with tides and currents in canals is to learn about any canals that you will be traveling through — you can look them up online or contact your local boating or waterway authority. If you are going to be traveling through a canal whose tides will affect the times you can pass through it, such as the Cape Cod Canal in Massachusetts, you need to take a look at the tide tables for the day on which you are planning to navigate through. (As a side note, it is always a good idea to look at tide tables when you plan to be out on the water, but in these cases it is absolutely necessary). The ideal way to traverse these types of situations is with the tide — you want to ride the tidal current through to the other side. Wait until the tide has turned in your favor, and then begin to make your way through the canal. You do not have to go at the exact moment that it turns, but you do want to make sure that you have enough time to pass all the way through before it turns against you. Many canals and rivers have navigable dams, which can be traversed through the use of locks. A lock is a watertight compartment or series of compartments located in a dam that can be filled with water at controlled rates so that a boat can move downward or upward through the structure of the dam. If you are going downhill (i.e., the side that you are on is at a higher elevation than the side you are going to) through the dam, the lock needs to be full when you approach. If you are going uphill, the lock must be empty. Depending on the size of the dam, the lock may be manned by experienced operators or by boaters themselves. If it is manned by boaters, you should take care during times of high traffic to make sure that no other boaters are coming in your direction when you enter the lock. Bigger locks will sometimes have mooring lines along their edges which boats passing through can attach to. This will keep you from drifting into the walls or into other boats. If you are using a lock that is manned by others, then wait for their instructions and be mindful of high traffic areas. All in all, locks are fairly easy to use; be careful, but do not be intimidated. In fact, the same could be said of canals in general. Watch out for other boaters, know the area, the tides, and any obstacles that you might encounter on your journey through a canal.